Michael Kim earned a spot at the Open Championship after cruising to his first PGA Tour victory at the John Deere Classic. Kim carded a final-round 66 as the American golfer claimed a comfortable eight-shot win for his breakthrough triumph on Sunday. The 25-year-old was a class above throughout the rain-hit tournament and he capped a stellar week by setting the 72-hole record at the John Deere Classic, having finished 27 under overall. Kim, who posted four successive rounds in the 60s, was flawless again on the final day as he holed five birdies without dropping a shot en route to becoming the 156th and final player to qualify for next week’s Open. Dominance. 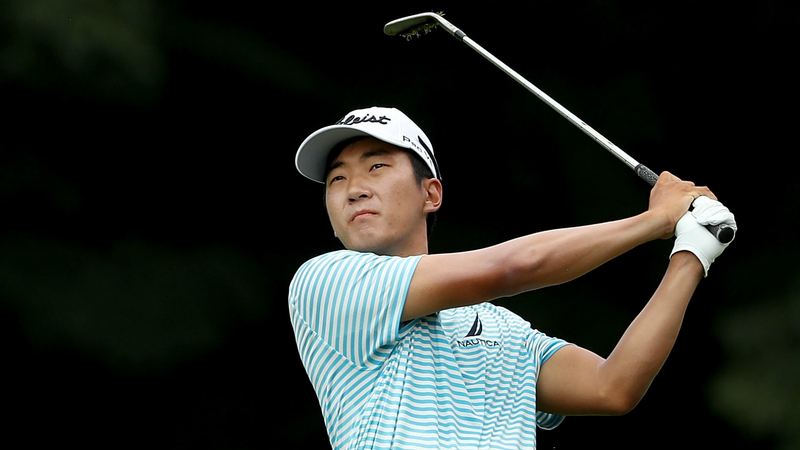 @Mike_Kim714 sets the @JDClassic 72-hole record! Italy’s Francesco Molinari surged up the leaderboard to secure a share of runners-up check thanks to a seven-under-par 64. Joel Dahmen (65), Sam Ryder (66) and Bronson Burgoon (69) were also 19 under for the event in Silvis, Illinois. Harold Varner III (68) was a shot further back, two ahead of Kevin Streelman (65) and John Huh (66).